If you’re new to working with resin, check out our previous blog which provide some general advice for the cleaning and assembly of resin miniatures. Once you’ve had a read through that article, continue on to see how to assemble Kashaw! A 3D printed prototype was used to create this guide -- not the final resin production piece. This is why the miniature shown in the assembly section of this guide is a different colour to the grey of the resin miniatures you’ll receive. The pieces will be same though! Always dry fit your pieces before trying to glue them, to ensure a good fit. Glue the body to the base first. Make sure that he is not leaning to far forward or backward. Then Glue the shield arm on. Make sure to hold securely and get 2 points of contact: the shield to the leg and the arm to shoulder. Finally glue the Spear arm on. Make sure the spear fits well on the shoulder before glueing. For this tutorial, Army Painter paints were used. These are nice paints that are widely available online and at your local game store. When using Army Painter be sure to shake them very well, and when you squirt them out onto your pallet mix them with a wet brush before applying them to your model. I recommend their Regimental Brush as well. It is what was used to paint this whole miniature and is a great all-around work horse brush. If you’re brand new to painting and find it all a bit intimidating, we hear you! To achieve a great looking paint job using some fantastic beginner techniques, only follow step 1, step 2, step 3, and step 6. 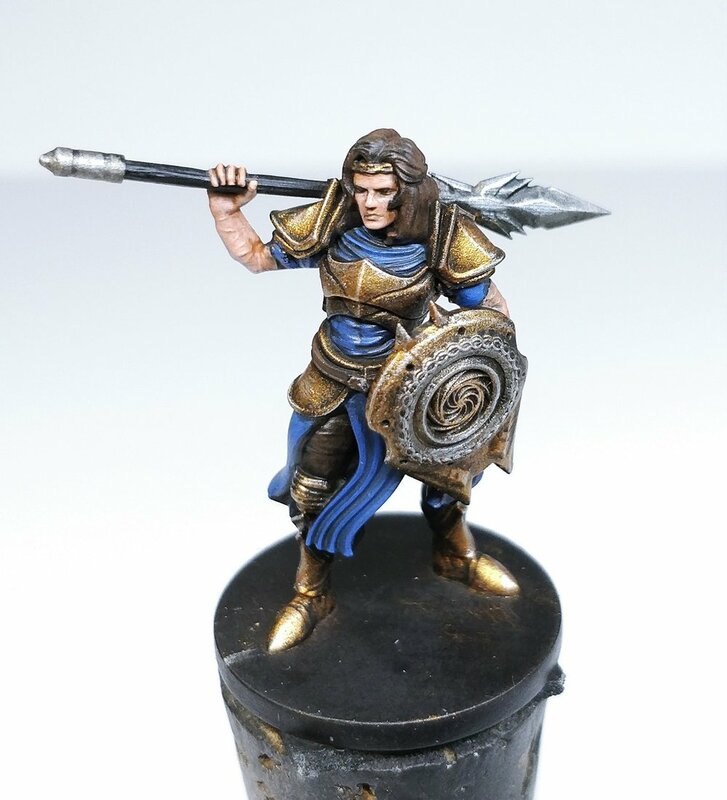 These steps show the basics of blocking in base colors over the entire miniature, adding some washes to these base colors to help bring out the detail of the sculpt, and some finishing touches such as basing your miniature. The first step is to block in your base colors. When working with a model that has a lot of metal parts, it can be a good idea to dry brush the metals first, before blocking in the rest of the color. To dry brush, use a small older brush with good bounce to it’s bristles. Put some unthinned paint on your brush of choice, then wipe most of your paint off of your brush on a paper towel (hence the term dry brushing). Then, with quick back-and-forth sweeping motions, brush the models gold areas. Building up the gold will take quite a few passes, but just take your time and move around the model. If your brush gets clogged with paint or gets too wet, simply rinse it off and dry it thoroughly before continuing with your dry brushing. With the main metal areas established you can work from the innermost detail outward, cleaning up any areas which were caught by the gold while dry brushing as you go. Use thinned paint and multiple thin coats to get a nice smooth even layer with good coverage. These washes will help to shade the model and smooth out brush strokes. Mix them well but don’t water them down too much or they can dry leaving a very chalky finish. Apply the washes to the different areas of the model as show in the list above. If you apply too much, simply rinse your brush, dry it off, and then use it to wick up the excess wash from the model. You will want the wash to pool in the creases and folds of the cloth to help shade the model, but be aware of excess wash pooling toward the bottom of the miniature. The washes will dull down the model quite a bit, so you will need to bring back some shine to metals, and brighten up some of the other colors. Carefully apply the skin colors, and avoid flooding paint into crevasses. When you get to the metals, carefully brush the raised areas (similar to a dry brush but lighter), and try to be more accurate with your placement. Once you have done the Greedy Gold you can then highlight all the metals with Shining Silver adding that extra shine to gold and the spear. Don’t dry brush here -- simply run the edge of your brush along the raised edges of the armor. If you have made any mistakes, go back and clean them up with the appropriate color. Then if the eyes need it, black them out and/or add separation back between the fingers. If you are happy with your model, you can stop here as the next step is optional. However, be sure to paint your base black or base it as you see fit to add that extra finished look. If you want to bring some extra attention to Kashaw’s scars, use some thinned Grimoire Purple and very carefully paint them, making sure to let the skin color show through to give it that translucent skin look. 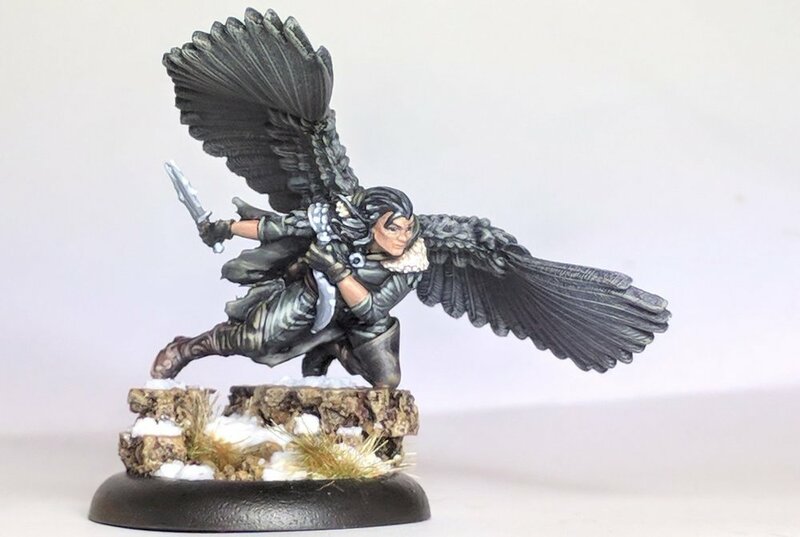 We hope you have enjoyed this tutorial and found some useful tips to help you complete your very own Kashaw miniature. If you find yourself struggling with a technique or are unsure where to start, do some test painting on other miniatures first or even on paper to help with brush control and paint flow. We would love to see your results once your Kashaw miniatures arrive, so post them up on Twitter using #CrittersPaint! Click to view Jen’s painted model on twitter!